CLASSIC DESIGN - Inspired by Clubmaster sunglasses. 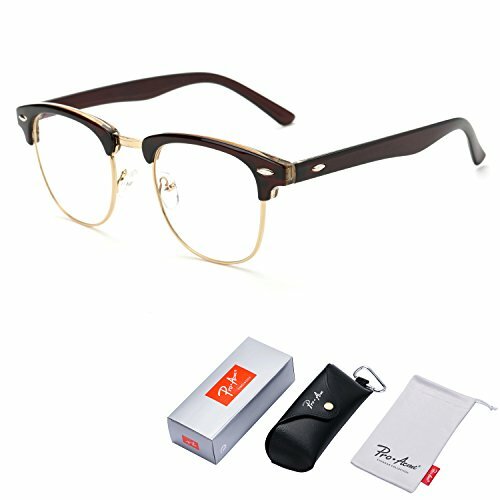 It is a wayfarer eye glasses frames with Clear Lens Non-Prescription(Rx-able) for Reducing Harmful Levels of Blue Light Screen Monitor Glare Anti Fatigue Reduces Eyestrain from Video Gaming Working Long Hours. You can wear it for fashion. Of course, you can also replace them with your own prescription lenses at the local optical eyewear store. PREMIUM MATERIAL - Made by polycarbonate lens, high quality metal and plastic, in order to ensure durability and avoid breakage while engaging in recreational activity. PREMIUM PACKAGE - Comes with Brand Gift Box, Authentic Pro Acme Microfiber Pouch, Microfiber Cleaning Cloth and Tag.